The spelling of the surname Henebry has changed over many years. The letters "n" and "r" and "e" have been added in various fashions. The first Hennebery in Ireland is "claimed" to be Lord Philip Hennebery, an English landowner. He had a castle and land in County Meath outside of Dublin in the 13th century. Philip de Hynteberge (de Hindeberg) was lord of the manor of Rath, County Dublin, in 1250. He was part of the Norman military aristocracy sent to control Ireland. The family, later called Hanebry, migrated to Counties Kilkenny and Waterford. They are chiefly found in the latter county to-day, though the name is not common. Father Richard Henebry (1863-1916) was a foremost Gaelic scholar and collector of Irish music. Irish sounding names such as Henebry, Gogan and O'Dell are quite common in Ireland, yet none of them are of Gaelic origin. 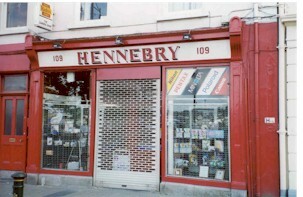 Henebry is one of the best known of the Norse/Norman names that has become naturalized by long association with Ireland. The surname became known as de Hionburgha in Gaelic and became anglicized to Henebry/Hanebry/Henneberry in the 15th century. Source: MacLysaght, Edward, Irish Families. Dublin: Irish Academic Press, 1991. pages 21, 193, 204. We have a record for Maurice Henebry of County Limerick, the Diocese of Cashel. His will was made in 1739 and probated in 1760. William Henebry (1760-1830) is buried near Galbally in County Limerick. Province of Munster. Henebry Family. Surname indicates Norman origin. As with most genealogy searches, disagreements regarding the origin of the surname is common. Some accounts indicate the family came from Germany to Ireland. Irish Roots Magazine indicates an emigration of Palatine Germans to the Limerick/Tipperary about 1709. There is a village in the Palatinate called Henneberg. Henry Hennebery and his wife Mariah, both from Germany, were living in Franklin County, MO from the 1850 census. See the Norman invasion of 1169 for De'Alton or D'Alton and others. Also research the old Gaelic Surnames of Henry. The surname is also claimed to be De Hindeberg from Denmark in a Germanic form. After the English occupation of Ireland in the 12th century, many Irish surnames were required to be changed to English names. In 1465, the English King Edward IV demanded all Irish take a surname of an English town such as Sutton, London and perhaps Henbury. After the defeat of the Stuart forces by William of Orange during the Battle of the Boyne in 1690, the Irish forces continued to fight the English. The Irish were defeated at the Battle of Limerick, and The Treaty of Limerick in 1691 gave the Irish army the option to sail to France. Over twenty thousand Irish soldiers left for France and fought in European armies over the next 200 years. Several of the soldiers came from the Galbally area of County Limerick. The "Wild Geese" often returned to Ireland with European wives. These Henebrys and others were not German, Spanish or Danes, rather they were Irish returning to their native land. By the early 700's, the Vikings' ship building technology had developed the capability to allow masts and sails on their ships. This advancement allowed them to travel farther distances, and they begin attacks on Ireland in 795. The native Irish did not build towns. It was the Vikings who established Dublin and Limerick and other towns and villages in Ireland. The Vikings (Norsemen) were often called Danes by the Irish, but the majority were Norwegian. The land of the Vikings was called "Lochlann". During the 9th century, the Vikings had established strongholds in Ireland. A village called Cu was located near Galbally in County Limerick and the Cussen surname may be linked to the early Vikings. Galbally (An Gallbhaile) in Irish, means the foreigner's town. Although most of the Vikings were from Norway, some were from Denmark, and they settled near Limerick in the 9th century. The Gaelic term for the Danes was "Dubh-gall" or dark foreigner, and the term for the Norwegians was "Finn-gall" or fair foreigner. Galbally: bally = (Townland) and Gall = (foreigner) = Townland of the Foreigners. The Vikings (Norseman) settled in Ireland married into Gaelic families and adopted the native language, religion and customs. These Gaelic-Vikings fought their distant relatives a few hundred years later during the Norman invasion. The surname de Hindeberg or de Hynteberge would seem to have roots from the Viking-Norman-Frank surnames. This name appears in Ireland by 1250, and when translated to Irish became Henebry/Henneberry. The Anglo-Saxon origin of the surname: Another view. The English origin of Henneberry follows below. Serious research would indicate the surname, Henneberry, has a well-authenticated Anglo-Saxon origin. Any European origins would be speculative at best. The most reasonable answer would appear to be the name of the town as a surname. See the town of Broadhembury, England. Examples: Jack from/of London - Jack London; William from/of Atberry - Bill Atteberry. Henneberry (English) One who came from Henbury (high fort), in Gloucestershire. Henn (English) Descendant of Henn, a pet form of Henry (home rule); dweller at the sign of the hen or wild bird. The history of this ancient Sussex family traces its ancestry as a family of Anglo Saxon origin before the year 1100 and appears first in the ancient records in Sussex . Source: Elsdon C. Smith, American Surnames, Chilton Book Company, Philadelphia, 1969, pages 230-231. Other terminations are the -burg endings, from Old English beorg and Old Norse berg, often spelled -brough, -borough, -bury, even -berry, usually meaning "a fortified place," later "a town," as in Yarbrough "earth" and Henneberry "high." There are many with the suffix -bury, the same names often being also with the suffix -berry, which contains a mans name as the first element, as Dewberry, "Davids fort." Names which indicate the material used in building the fort are Woodbury, "wood," Stansbury, "stone." Source: P. H. Reaney, The Origin of English Surnames, Barnes & Noble, New York, 1967, page 44. Some common place-name elements are weakened when final and unstressed and were re-spelled in a way which often disguises their origin; these weakened forms were then often confused and incorrect forms substituted. For instance, the Somerset surnames, Hembra, Hembrow, Hembry, Hembury and Hennebry may derive from Emborough, Broadhembury, two Devon places called Hembury or Henbury, all from burh (fort) or from two other Deven places named Henborough, both from beorh (hill). Source: Hanks, Patrick and Flavia Hodges, A Dictionary of Surnames, Oxford University Press, 1988, page 85. Bury, English: habitation name or topographic name, ultimately from the dat. case, byrig, of OE burh, fortified place, originally used after a preposition (e.g. Richard atte Bery. As inflections were lost in ME, derivs of the OE dat. replaced the OE norm., the word taking such forms as biri, berie and burie. In ME it denoted a fortified manor house, and the surname was used for someone who lived near a manor house or as an occupational name for someone employed in a manor house. The word also came to denote a fortified town, and is therefore a habitation name from any of various places so named. From this sense developed the modern English work borough. The History and Coat of Arms of the Henebry family: Click for Coat of Arms. Two coat of arms are claimed. The first consists of three gold horns and a gold chevron separating them on a red background. The second depicts a tree on the top half of the crest with a gray deer shown below. Henley/Hensley : English Place name...Originating in Suffolk and Warwickshire, from Old English heah meaning high + OE leah meaning wood/clearing. A Henley or Hensley would be one who lived near the high clearing in the woods. Henson is an English patronymic name derived from the Middle English given name Henne, which was a shortened form of Henry. Henn is the surname commonly associated with the name, with Henson as a patronymic form. Henkin is a diminutive form. Hemm and boerg: "from the borders of the large hills" Anglo-Saxon. Hemburys and other variations of the name can be found in records for the South West of England from the 13th century. Many of these are concentrated around Hembury Hill in Devon, but there are many more in Somerset which is home to the Mendip Hills. One theory is the name originated with Germanic (Viking) invaders who spread across Europe in the 8th and 9th centuries. Somerset was the stronghold of the Saxon King Alfred who defeated the Danes helping to establish the Saxon Kingdom. Alfred's base was in the marshland of the Somerset levels. The treaty to end the was was signed at Wedmore ("place of the pact") in North Somerset. Church records for Wedmore show many Hemburys over the centuries. Many variations of the name still exist in the area today. The port of Bristol is only twenty miles to the north and considerable trade was conducted with the southern Irish ports such as Cork. The United States Census Bureau for 1990 lists a frequency distribution of surnames.